How bad is the pollution? A garbage truck’s worth of plastic is dumped into our world’s oceans every minute. All told, humanity has dumped up to 14 million tons of plastic pollution into the seas, and bits of it can be found from the water’s surface down to its most extreme depths. You wouldn’t know it looking over the side of a ship, since much of the waste has been broken down by waves and ultraviolet light into microplastics - tiny pieces of broken-down plastic smaller than your little fingernail. Scientists have no idea how long it will take to degrade - perhaps hundreds of years, if ever. By 2050, according to the World Economic Forum, there will be more plastic, by weight, in the ocean than fish. Where is it coming from? Plastic is appealing because it is cheap and versatile, but also virtually indestructible which makes it a nightmare to dispose of. Fishing nets and other plastic fishing gear are a major source, along with lightweight plastic litter, which can be blown off garbage trucks, barges, and landfills, or deliberately dumped into rivers or sewer systems and carried out to sea. Many of the worst polluters are developing countries with crude waste-management systems. A less obvious form of plastic pollution comes from microparticles found in products such as deodorant, toothpaste, and sunscreen that wash down drains. Many clothes are made with synthetic fibers, and one wash cycle can cause 200,000 fibers to escape into wastewater. Where does it all go? There are five massive patches of plastic in the oceans around the world, created by ocean currents. These huge clusters of plastic debris cover swaths of the ocean. The largest is between California and Hawaii, and it’s the size of the state of Texas. Another plastic patch along the North Atlantic between Virginia and Cuba is almost as large. These five massive patches cover as much as 40% of the ocean surface. To clean up all five would take 1,000 boats filtering the water 24 hours a day for 79 years. Is it affecting marine life? Many marine organisms can’t distinguish common plastic items from food. Animals who eat plastic often starve because they can’t digest the plastic and it fills their stomachs, preventing them from eating real food. In June, a whale died in a Thai canal and its stomach contained 17 pounds of plastic, including 80 shopping bags, which prevented the whale from digesting food. Fish, mammals, and birds dead from a similar cause are washing up on beaches around the world. Are humans at risk? The evidence is unclear, but some common additives in plastic behave similarly to human hormones and might do damage in high concentrations. It is becoming increasingly difficult not to ingest plastics. A study last year found that 83% of the world’s drinking water is contaminated, while this year researches found 93% of bottled water contains some plastic - often double the amount found in tap water. Some seafood that humans consume also contain plastic. What’s being done? There are growing efforts in the U.S. and abroad to use less plastic, such as the #StopSucking campaign to get rid of disposable plastic straws, and there are municipal laws banning plastic bags. Unfortunately, the environmental net gain of such efforts is small and scientists agree that effective remedies to plastic pollution will require global cooperation. The European Union launched a “plastics strategy” this year that aims to make all plastic packaging recyclable by 2030. 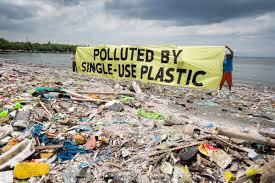 However, at the G-7 summit in June, the U.S. and Japan refused to support a declaration on climate change that included targets on curbing plastic pollution, fearing its impact on their economies. Closer to Home: Loggerhead Marinelife Center (LMC), Juno Beach, and The Gardens Mall hosted the sixth annual Marinelife Day on August 18th. This year’s theme was #PlasticFreeWithLMC. The goal was to educate the public on ocean conservation and sea turtles, focusing on the importance of reducing single-use plastic materials from everyday routines. It was a great opportunity to learn about the ocean, the environment, and helping the future of both.